Last time I reviewed four new eaux de cologne from Australian perfume house Fleurage. 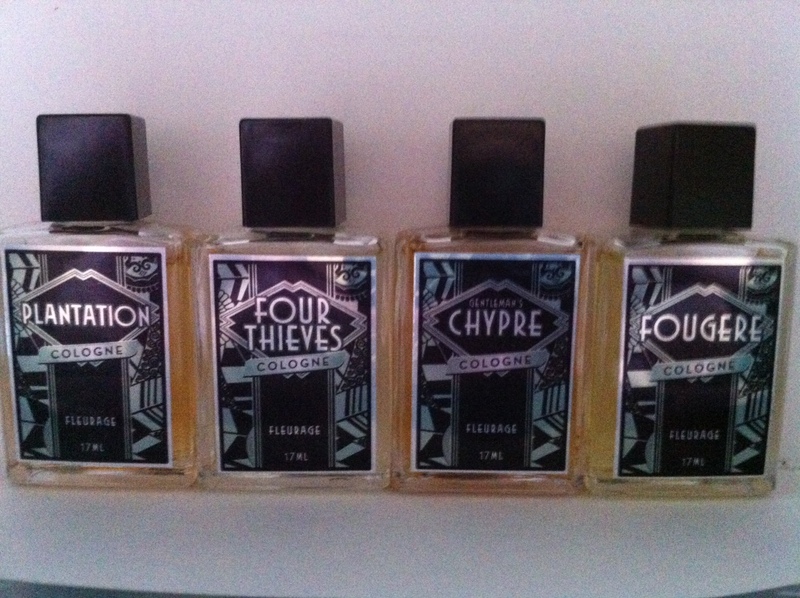 Today I’m going to write about the other four, Plantation, Four Thieves, Gentleman’s Chypre and Fougere. Plantation is meant to evoke the idea of a tea grower in India, resplendent in a white linen suit. Notes are marine. grass and greet tea. This is the only one I really didn’t care for. I’m not big on marine notes and on my this one was very sweet. I like my tea un-sweetened, so I’ll pass on this one. Four Thieves is “Legendary Highway men of Marseilles protected by the four thieves vinegar.” I don’t if that protection was by consuming it, wearing it or throwing a bottle at foes, but there’s nothing vinegary in this that I can discern. Which is no bad thing- I don’t need to go around smelling like salad. It starts off with a bright mint and green notes then adds in pepper, nutmeg and more wood. I like it. Gentleman’s Chypre had me at the get-go with it’s soft and luxuriously powdery opening. Written of as a “dapper debonair detective inspired by Sherlock Holmes and Hercule Poirot.” I can see that- along with the opening it adds in a glove leather and a touch of ambergris that makes me think of country houses and the Orient Express. Of these four Fougere was my favorite by far. It opens with a lovely bergamot and green notes and adds in a slightly smoky woods. It does a great dance between sweet/bitter that says to me “classic fougère” and last surprisingly long for both a cologne and a botanical. Can’t wait till this comes out. Actually I can’t wait for a lot of these and hope they hit LuckyScent or someplace in the states. A big bottle of Bay Rum may go on my list for Santa this year. AUSTRALIAN? Where can I get in touch with these guys please? She’s in South Melbourne and at http://www.fleurage.com.au and Facebook As Fleurage Perfume Atelier. If you can go to the atelier in person, I’d recommend it!